The honor system speaks of a simpler way of life in Nova Scotia. If you need some wooden buoys or lobster pots for a day of fishing, just take what you want and leave the money in the white bucket. This scene is so colorful and delightful, it makes a unique seascape painting. The original watercolor painting has been sold. 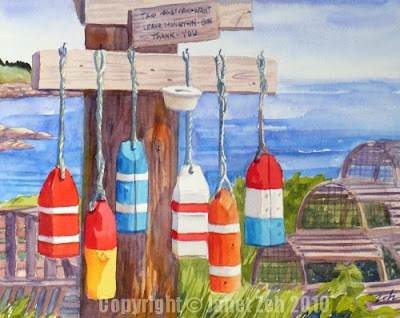 Let me know if you would like to order a print of Buoys and Lobster Pots or have one painted just for you. Thanks for stopping by and have a lovely day! The colors are spectacular in this piece. I just love it! Whenever I walk by the painting where it is propped up with the others waiting to be sold, it catches my eye. The buoys are so vivid. I love that they were made of wood.